Hope you had a wonderful Thanksgiving. There is much to be thankful for. It’s true! To remind us, John wrote a poem on the wall at the East Village Life Café. It’s the little everyday things to be grateful for, and I was grateful for his reminder. We reproduced it below. I hope you enjoy it. We launched Chef Vincent’s new brunch menu on Thanksgiving Day. While it was a rough start, as new menus often go, everyone got fed and enjoyed their meals immensely. A particular favorite by vegan and meat eaters alike is the “Tempeh Reuben Sandwich.” Go to the East Village Menus “Brunch” page where you’ll find it listed with all the other improvements and fun twists Chef’s done to the Life Café fare. We’ll soon have his rendition of our All Day Menu launched. And he’s already doing his dessert magic; like his delectable “Lemon Tofu ‘Cheesecake’” that he serves in a champagne flute. Really! Come in soon to enjoy what he’s done. We do brunch from 10 am to 4:30 pm Saturdays and Sundays. Chef prepares his scrumptious breakfast breads then too. A basket of his assorted sweet breads comes with every order. 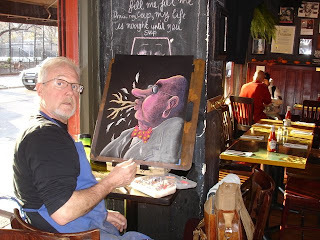 John is creating his Riddle Raffle pastels right in the café in the East Village now. You can watch him working on a new one there early every Friday afternoon catching the wonderful soft low sunlight filtering through the trees in Tompkins Square Park. Life Café has always had a tradition of communication, whether through conversation, performance, or art displayed on its walls. Prose and poetry, usually in the form of live spoken events was a feature of the café life back in the 80’s and 90’s. Today that tradition continues with the appearance of poems and art written and drawn in chalk on the walls by John Sunderland. (If you have a poem about Life Café life, email it to us and if we like it we’ll feature it in the café blog). Hey I love it all! 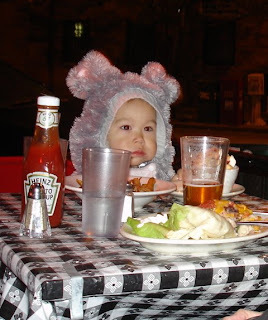 This small furry creature was discovered nibbling crumbs from the sidewalk tables on Halloween night in late November. A rare and as yet unidentified species! Something crazy goes on at 983 on Wednesday nights. It’s not official. No, no, it’s the staff. (Maybe we’re too lenient? Oh, but it is fun…) Some of the staff make up a theme for the way they dress. One week was “Ballroom Dancing” and our lovely Shaeffer behind the bar wore a large gleaming rhinestone necklace and swirling skirt and looked absolutely fabulous. Last week was “Sweaters with Animal Print”. Next week I was told it’s “Your Worst Holiday Sweater”. They’re artists, so they do come up with good imagery. So stop in Wednesday anytime after 5 pm and get an eyeful and a chuckle. And, hey, you could join in. Just give a call a couple of days ahead to find out what they’ve come up with for that week. Oh, don’t come Wednesday, December 10th as 983 is closed for a holiday party. Last seating is 6 pm and we close at 7 pm. 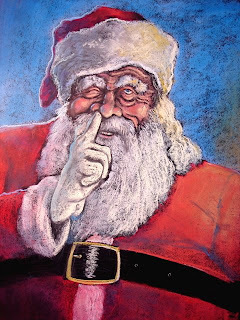 Here’s a seasonal image from Bushwick. This is last week’s Riddle Raffle drawing at 983 titled “Seasonal Pick” after the group of Special Drinks from our drink men. I know, I know, it’s tacky. But so is John. After all, he’s a Yorkshireman, and they’re funny guys, in all meanings of the words! By gum, we do like to have fun….